Come 1st of February, it will be illegal for drivers to hold any type of mobile device while driving, reported The Straits Times. Previously, only calling or texting someone on a mobile phone was barred. 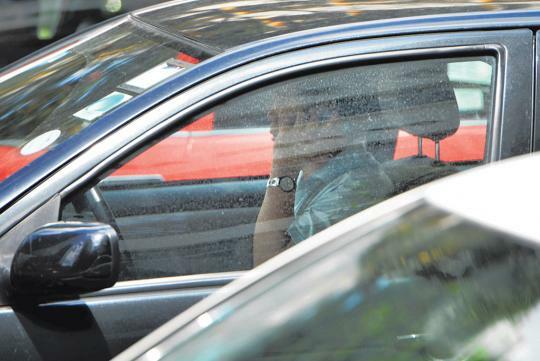 The changes were prompted by a 20 percent rise in the past two years in the number of summonses for using a mobile phone while driving - from 2,938 in 2012 to 3,572 in 2013. We bring you through the changes in the rules. Anyone caught using and holding a mobile device while driving can be found guilty of committing an offence. To be specific, mobile devices are any handheld equipment which are designed or capable of being used for telecommunication. This means phones as well as tablets. It is not against the law to use your mobile device when the vehicle is stationary at a red light. However, you are strongly encouraged to not do so. The amended law applies to drivers holding a device. It is not an offence to use the mobile device if it is mounted on a holder. Holders can be bought through online and retail stores from around S$10 onwards. One of the more popular mobile holders is GripGo. First time offenders can be fined up to $1,000 and/or jailed for up to six months. Repeat offenders face up to $2,000 in fines and/or up to 12 months in jail. Wearable technology such as the Google Glass and smart watches are not covered in the amended law. But the use of such devices could be classified as inconsiderate driving, an offence which carries up to a $1,000 fine and a six-month jail term. Senior Minister of State for Home Affairs Masagos Zulkifli commented on this during the amendment of the law in parliament that they will continue to monitor the situation... and study the practices of other jurisdictions as they evolve to deal with (new) types of smart devices. "The law applies to using and holding a device while driving, including when the car is stationary at a red light." 65B.—(1) A driver of a motor vehicle who uses a mobile communication device while the motor vehicle is in motion on a road or in a public place is guilty of an offence and is liable on conviction to a fine not exceeding $1,000 or to imprisonment for a term not exceeding 6 months or to both." So where exactly did this business of "being stationary at a red light" come into it? I have seen a video of a traffic policeman (on a bike) in Australia catching motorists who were using their phones while stationary at a traffic light. Apparently it is against the law. Can anyone confirm that? I don't know what OZ law says, but here the statutes are quite clear. Unless they're using some weird, non-intuitive definition of "motion" but that can easily be legally challenged if push comes to shove. I use my phone at red lights (mainly to check Whatsapp and emails, because they don't transfer to my iDrive), but as soon as the light turns green, I toss the phone to the passenger seat *before* stepping off the brake. Every time. The story has been amended in The Straits Times. Faiming, please edit your article so it will be accurate. Thanks.